Choosing a great color palette is essential when you’re making games. The right color scheme and combinations can make your game look polished and unique. Both are key factors for success. Unfortunately, it’s not always easy finding that perfect color combination for your game design. If you’re having trouble deciding which colors go best together, there are tons of different color palette generators and color scheme tools available that can help. Color palette generators make it easy to choose the right color combinations even if design isn’t your forte. Most of them are also completely free to use. So, they’re handy online tools to have bookmarked and added to your game development arsenal. We’ve compiled a list below of some of the best color palette generators and color scheme tools to help you with your next big game project! COLOURLovers is a creative community where people from across the globe share color palettes, patterns, and discuss the latest trends. It’s a great site to go to for not only color palette generators but to also learn more about color and design in general. So, if you’re new to choosing color schemes, it’s a great place to start. 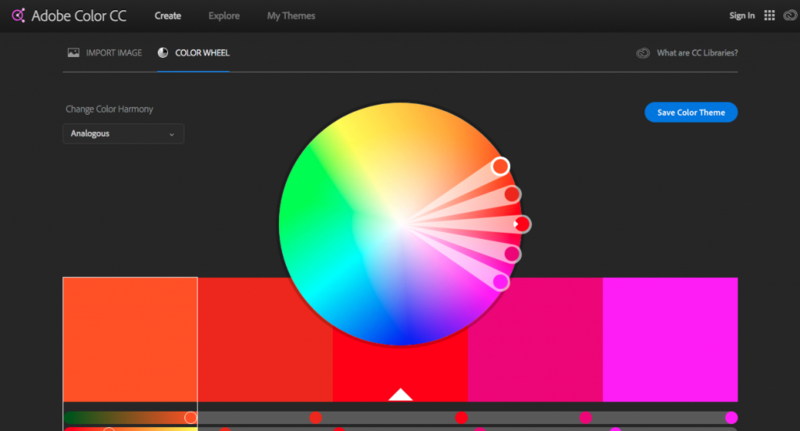 You can browse over 4,577,013 color palettes for inspiration and even create your own. They have several basic to more advanced color palette generators available including COPASO. With COPASO, you can generate your color palette using various advanced preset options. But at any time, you can switch back to the basic color palette tools if it’s not up to your speed. There’s also a massive library of shapes and patterns that you can browse through. With COLOURLovers, you can discover the latest trends in design. You can learn more about color as well by participating in the community via groups, forums, and their articles. The Adobe Color Wheel can help you come up with striking color schemes also. If you’re an Adobe Photoshop user, you’ve probably already tried out this handy tool. However, anyone can use the Adobe Color Wheel to browse thousands of color combinations and create color schemes. Users have the option to make a palette from scratch, upload an image to use as inspiration, or choose a palette from the Kuler now referred to as Adobe CC community. It’s an excellent tool to use. 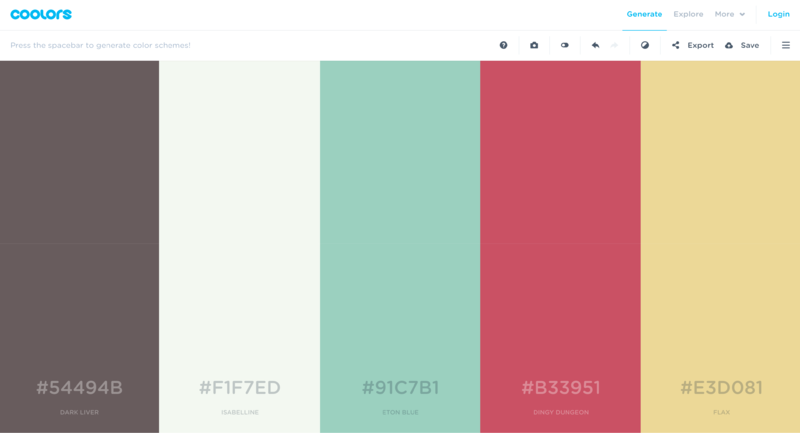 One of the easiest to use color palette generators is Coolors. This tool allows you to generate beautiful color palettes by merely pressing the spacebar on your keyboard. You can keep any color you like by clicking to lock it. This is an excellent option for those times when you find that you only want one or two of the colors in the palette. You can press the spacebar again and just the colors not locked will randomize. It’s a convenient way to find the perfect color combinations quickly. You can also start with your own colors by typing in their format (HEX, RGB, HSB, CMYK, etc.) and locking them to generate matching colors. There’s also a ‘monochromatic mode’ that allows you to find monochromatic palettes. So, if you’re making an indie style game with a unique art style, this particular mode could be useful. Like most color palette generators, you can also generate color schemes using photos. Coolors’ color palettes can be exported to PDF, PNG, SCSS, SVG and Copic markers with a click of a button. You can also share your palette link to send to team members or an outsourcer that you have helping with your project. Coolors is free, but it has paid apps and extensions as well. The iOS app version costs $1.99 USD, and there’s an Adobe Add-On version available for $5. Palettable turns finding the perfect color combination into a game. This tool randomly generates a color that you can choose as your first color in your palette. Users are given the option to click like or dislike. If you like the color, you’ll be given another color that goes together with it. However, if you hate the color an entirely new color will appear each time until you find the perfect color scheme that fits your needs. Palettable is a little different from most color palette generators since it functions in a minimalist style. If you have no idea what color or colors you want, you might want to give Palettable a try. Hail Pixel’s Colordot is an intuitive, sleek color palette generator that you can use online or conveniently on your iPhone. You can quickly build beautiful color palettes with a simple swipe of the mouse or with your finger for the iOS version. Swiping left or right will change the color hue. And swiping up or down will adjust the color’s brightness. Colordot for iOS has a cool camera feature that enables users to snap a photo and have the exact color palettes revealed. It’s an excellent tool to have when inspiration strikes. If you’d like to dive even more in-depth and learn the meaning and symbolism of the different colors in these palette generators, you can find a comprehensive color guide on Jen Reviews. The more you know about colors and their spectrum the easier it is to find the best combination for your game. ColRD is one of the few color palette generators that’s all about drawing inspiration from images. Along with the traditional create your own color scheme options, ColRD lets users upload a picture or choose from their massive community-based library of images to find matching color palettes. The library alone makes it a useful resource site to bookmark for color inspiration. ColRD also has a feature an intuitive grid that produces 140 matching color suggestions next to the shade you’re customizing to make adjusting easy. 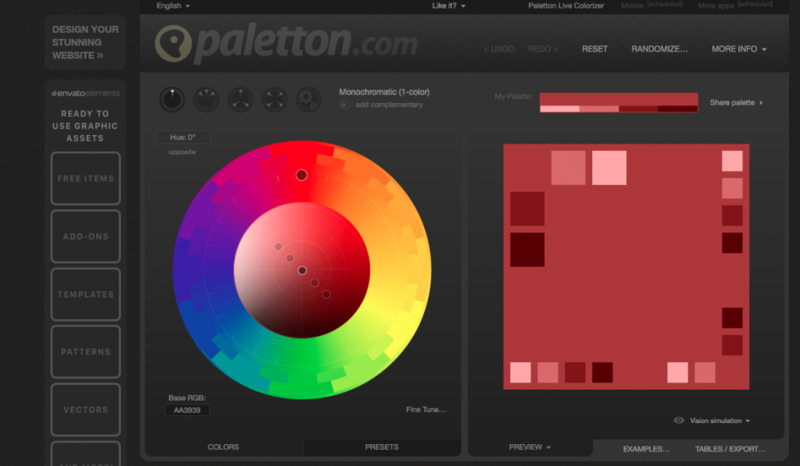 Paletton is a color palette generator with a wide range of customization options. You can use their presets to create a beautiful color scheme for your app or game project. They have 24 different preset color effects, including vivid pastels, neon, and glossy shades that you can use to fine-tune your color palette. There’s also an option to make your own color palette from scratch. With Paletton, you can also export your palette in multiple formats including CSS code. Color palette generators or color pickers as they are sometimes referred to can also be used to help you with your app icon design. Color Supply is an awesome color picker for finding inspiration for designing icons and your game’s overall color scheme. You can select various hues and mixes, copy and paste the hex values or grab a screenshot to sample the shade in Photoshop. Color Supply takes the guesswork out of designing by providing users with a preview of the colors in SVG icons that auto-update as you change or adjust the brightness. They also have a list of featured artists that contributed to the color combinations plus helpful tips on choosing the right colors for your project. Also, all the palettes are entirely free to use. ColorHexa isn’t your typical color palette generator. It’s a color encyclopedia! When you select a color or enter a color value, additional information on that color, possible alternative colors, and sample schemes will appear. You can generate matching color palettes with complimentary, analogous, triadic, tetradic or monochromatic color schemes. 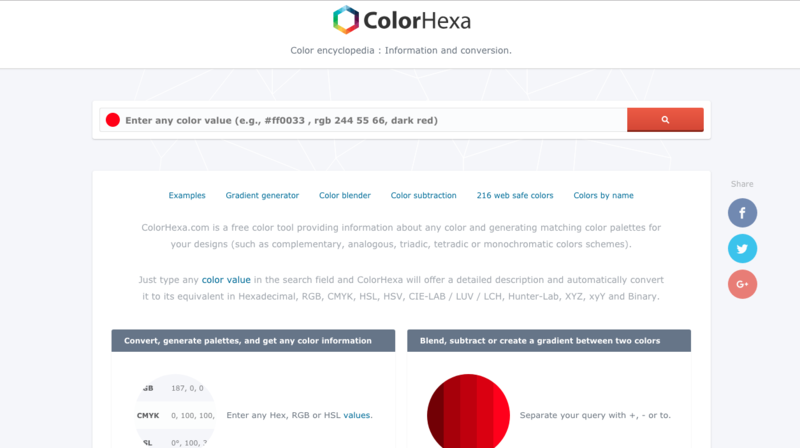 ColorHexa also features a handy list of colors by name along with other in-depth search features to help you not only find the perfect color combinations but understand why it will work as well. Another color palette generator worth considering is Color Hunt. This free tool is updated every single day with new color palettes made by its community members. Similar to ColourLovers, Color Hunt has a sleek interface with thousands of color palettes that you can browse through. They also have ‘Trendy’ and ‘Popular’ categories to make finding the latest trending color combinations easy. There’s also a free Chrome extension that you can download for Color Hunt as well. Colormind uses deep learning to generate the best possible color combinations and palettes for your designs. You can lock the colors that you like and Colormind will search and find new colors at random. This advanced tool learns color styles from a variety of media including movies and popular art. It can automatically select colors that will work well together. You can upload an image to pull color combinations for new palettes as well. They also have templates that you can experiment with to find a color scheme that fits your needs. All of these color palette generators are worth trying. To find the one that will best suit your game design needs, we recommend browsing through the list and picking several different tools to test out. Play around with the various features and select the one that you like the most. It all boils down to personal preference. If you’re having trouble choosing which color palettes would work for your game, we have an excellent tutorial video on game design that can give you further tips on selecting the right color combinations. Check this out, https://icolorpalette.com/ with lots of options like palette generator, editor, palette from image, palette from url and combine and download multiple palettes to one singe adobe swatch or pdf file and many more options.